There might be possible spoilers in the review. I can't believe I'm finally finished with this book. It took more than 2 weeks. Now, now, don't get me wrong the book is great. I loved almost everything about it, except maybe the too much describing that went on, but it's usual for epic fantasy books. I guess. 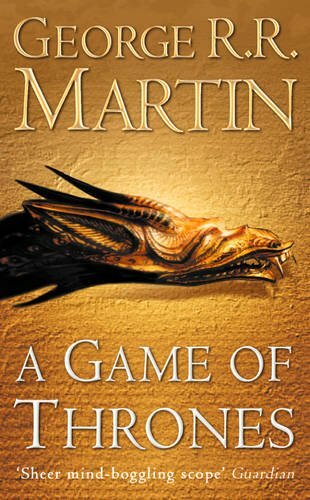 One thing before I start with the book, if you had watched the series, like I did, it gets boring reading the book, almost evertything is the same. And in the series you get to see all these amazing actors you can't help but imagine the characters in the book like them. 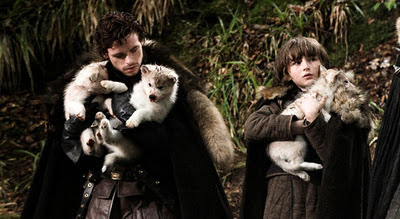 The book now, well, the one thing that the series got wrong is the age of the Stark kids, in the books they are younger, but I also think that in the book more time passes by, closer to a year, maybe more, which I didn't get from the series. The story begins with the Night Watch and what I thought would be the most important thing in the book, (not the night watch but the Others), turns out I was wrong. There are so many things going on. The Hand of King Robert dies and Eddard Start is called to take his place. He goes with a heavy heart, cause he doesn't want to leave half his family and his home back in Winterfell. When he arrive he realizes that maybe the previous Hand didn't have a natural death. He starts following in his footsteps, learning what he did before he died and finding out a (not so) socking truth. 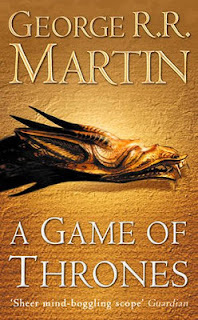 In the meantime, we also learn the story of Daenerys, she and her brother are the last of the Targaryen House. They are the last dragons, or blood of the dragons at least. She gets married in hopes to return home to the Seven Kingdoms and claim her familys throne from King Robert. There are a lot of twists and turns, but I saw them coming, cause I had watched the series. If I hadn't I'm sure there's no way I could predict some things. Like the ending for example, both for the Starks and Daenerys. Another think I didn't quite like about the book is that I get the feeling the author is a little bit cruel. Ok, it's war and a lot of people die, but he killed characters that weren't even fighting. I love all the characters and I came to care about them, I can't see them die in the first book! Also I wanted to know the story from Robb's point of view, since I believe he's one of the characters that had to change the most, but no... no Robb for me, not even in the next book! At least there's Arya point of view, she's my second fav. All in all the book was great, huge...but great! And I'm looking forward for the next one. P.S. My favourite part of the book are the direwolves. They are adorable! Love the review, got me hooked (even more) on this book :P Glad to hear you enjoyed it! Hurray! I can't wait to read this! Also can't help but notice the cover totally matches your blog background!